LONDON: 20 September 2017 - The directors of ECR Minerals plc are pleased to announce an update upon its four gold exploration projects located in Central Victoria, Australia. Following receipt of the transfer of the Avoca licence to ECR’s wholly owned Australian subsidiary Mercator Gold Australia Pty Ltd, the Company’s four gold projects (Avoca, Baillieston, Timor and Moormbool) in Central Victoria, Australia are now 100% owned by ECR. The company is also pleased to announce the following details of drilling and exploration plans across its portfolio of Victoria licences. Company objectives will be to deliver a high-quality low-cost exploration programme to test extensions to known mineralisation and to generate additional targets for more comprehensive programmes. The ultimate aim is to find and evaluate a mineral resource suitable for mining. Having previously been mined with a significant amount of gold production from both alluvial and hardrock high grade sources, ECR considers the Avoca project is highly prospective for hard rock structurally controlled gold deposits. At Avoca a 520m programme of reverse circulation (RC) drilling at the Monte Christo prospect is planned, as well as trenching at the Excelsior prospect to try and identify extensions to known mineralisation. 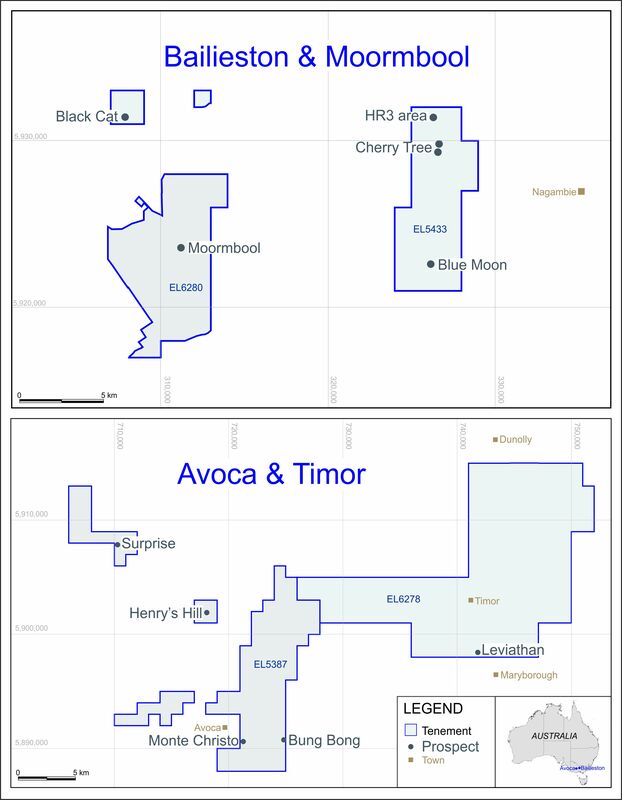 Several of the prospects within the Avoca licence are considered to be suitable exploration targets. As such, work programs have been prepared and submitted for government approval and are pending for Pyrenees Reef, Excelsior, Monte Christo and Bung Bong. When this is approved, ECR will need to get additional approvals including from Parks Victoria and for cultural heritage assessment prior to doing any work. Further information on the Avoca and Bailieston projects can be found in ECR’s announcement dated 9 November 2016. The Avoca projects are also prospective for alluvial gold; however, ECR is concentrating on the hard rock potential. The Bailieston area has historically been active for underground gold mining in the late 19th and early 20th centuries. Whilst most of these mines were relatively small, the target was only high grade mineralisation and not a larger low grade pervasive style of mineralisation that is shown to be present through the recent Bailieston open cut. For example, between 1880 and 1906, 8698 tons were mined from the Byron Shaft with 4416 oz gold produced at an average recovered grade of 15.5g/t Au. The Byron Shaft was worked down to 91 meters with other small shafts in the vicinity, but the low grade identified by ECR has not been worked. ECR considers the Bailieston Project to remain highly prospective. At Bailieston, ECR is planning a further 500m of drilling. This is planned to be diamond drilling to follow-up on the results of the 592m RC drilling programme completed earlier this year (refer to ECR Press Release July 24, 2017). ECR also intends to carry out trenching and/or soil sampling at the Black Cat hard rock prospect with a view to understanding the prospects better and potentially selecting targets for drilling. A work plan for Black Cat prospect has already been approved as a part of the Bailieston overall work plan. The Moormbool licence covers an area linking the Redcastle and Graytown goldfields east of a large regional fault. Due to pervasive alluvial cover, the licence area is largely unexplored. The licence is centred approximately 10km northeast of the high-grade Costerfield gold-antimony mine operated by Mandalay Resources. ECR considers the Moormbool project a wildcat project with a single target being based on a geophysical anomaly. The planned work comprises analysis of public domain geophysical data and a programme of soil sampling to an early test on this geophysical anomaly and help vector further exploration. Further information on the Moormbool licence can be found in ECR’s announcement dated 18 July 2017. There are a significant number of historic alluvial and hard rock mines within the Timor tenement. Timor was a major centre of gold production from alluvials with more then 650,000 tonnes of gravels mined for a total recorded production of more than 670,000 oz gold. In addition to the alluvial production, the hard rock production was also significant, with perhaps the most significant of the hard rock mines being the Leviathin group of mines. Historical production from the Leviathin group of mines is understood to have exceeded 67,500oz gold from 181,000 tonnes of ore, equating to a recovered grade of approximately 11.5g/t gold. The planned work comprises of analysis of public domain geophysical data, literature review, geological mapping and a programme of 600 soil samples across the Leviathan trend. It is expected that this work will enable the selection of targets for drilling. Further information on the Timor licence can be found in ECR’s announcement dated 22 March 2017.